Elisa is a very determined v35 Imola lady from the Moto Guzzi family. She was born in 1983 and then came to Sweden where she had several owners. Among them was the famous Swedish Speedway rider Einar Lindqvist. He loved motorcycles, especially Italian ones, and collected a large number over time. Nowadays one can take a look at these at the Motala Motormuseum. Since Elisa used to be part of Einar’s collection, even she spent 2 years of her life at that museum. Eventually she got sold to a new proud owner. Now she could smell proper garage air again and she was even allowed to run about 500 km a year through Östergötland. Not super exciting maybe, but clearly better than spending the rest of her life in a museum. She felt far too young for that, having only just above 14000 km on the clock. In 2008 her owner decided to separate from her. Not being in his youngest days anymore, he found new love, and his lady preferred a new kitchen to an old motorcycle. And motorcycling was never her thing anyway. This is how Elisa came to her current owner. Me. When Elisa and I met, I was a real motorcycle newbie. OK, I had my full mc-license and lots of experience in scootering around London, but riding a motorcycle was a new challenge back then. Elisa was quite forgiving when it came to all my little beginners mistakes, and it was from taking the first spin with her, that I not only felt secure, but simply that the two of us would be a great fit. 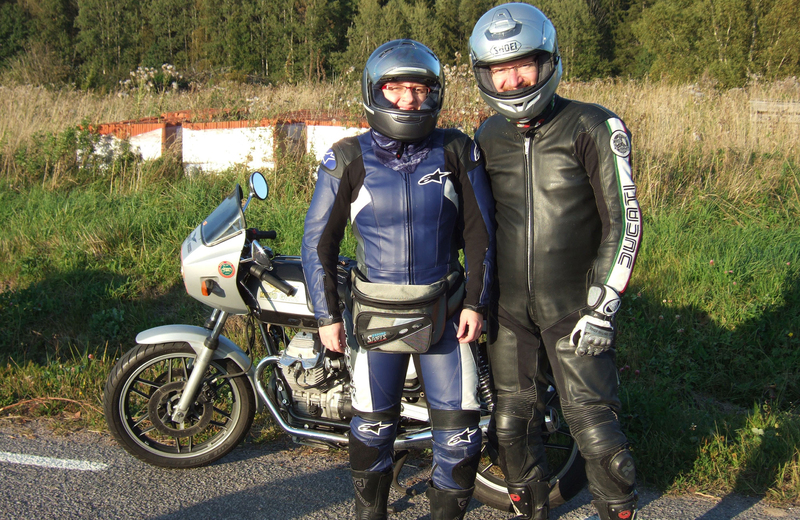 All in all we did far over 1000 kilometres together in that 2008 season – among others down to Ljungbyhed, to the 25-years celebrations of the Swedish Ducati Club, after that we rode to the Guzzi-autumn-meeting up in Harjarö, not far away from Stockholm. Since I didn’t know when Elisa saw some proper service last, I booked her in with Janne from Italia Bike Center in Arboga, who is one of the Guzzi and Ducati specialists in Sweden. The feedback I got was “You are extremely lucky to have made it here.” ??? If only he knew which other tours we already did… The thing was, though, that due to a leak more air than necessary entered the carburetors. On the other hand, that got balanced by another maladjustment that allowed too much fuel to enter, so we still ended up having somewhat of a correct air-petrol mixture for the motor to work with. So all in all really lucky – or simply pure determination of the bike, I wondered? Surely she wanted to see the world, took the chance with the new owner and simply decided to work. Finally no elderly men riding her anymore and no more museum days – finally a chance to live and cover some proper miles at a decent speed! This Summer 2010 we traveled down to Mandello del Lario, her birth place, and we did all in all almost 4600 kilometres. Our partners in crime and life were/ are “Röda Damen” (The Red Lady) which is a nice Ducati Paso 750 from 1990 and her lovely beholder Swedephotog. Again Elisa impressed all of us. Not a single part needed to be replaced, only a bit of oil top-up for the machine was needed. Lucky or pure determination? Therefore, we thought, we name this blog after her. Elisatravels.com will be dedicated to our motorcycle stories, be it about travels or repairs or anything that comes our way. After all we own five motorcycles together and that should make enough material to share with you, the interested reader. We love feedback and getting to know you – so feel free to comment here or on our posts and ask questions! Who knows – maybe someday the paths of our two-wheelers cross? whoa.. Its a v35 not a 50. nice. glad she found you.